The Ford Motor Company had high hopes for its new car, the 1958 Edsel. It was a highly promoted model, with lots of market research and advertising bought in anticipation of the new car. Named for Edsel B. Ford, son of Henry Ford, who founded the company, the Edsel was to be the flagship product of the late 1950s. Instead, it turned out to be a legendary flop. Ford wasn’t messing around. Work on developing the Edsel began in 1955, with a launch for the 1958 model of the new car slated for launch in the fall of 1957. They made the deadline, having sunk $250 million into this new vehicle. That might sound like a lot of money, and it was, but consider that $250 million in 1957 dollars works out to about $2.14 billion in 2016 dollars. Ford was going big. Ford announced its new car on a top-rated TV special called The Edsel Show, which aired on September 4, 1957, which Ford dubbed as “E-Day”. This special (which we’d probably call an infomercial today) sang the praises of the new Ford product. And it really did have a lot of neat features to offer. It included warning lights on the dashboard to alert the driver when the oil was low, when the parking brake was on, and when the engine was getting ready to overheat. (The Edsel wasn’t the first car to offer these features—the defunct Studebaker brand had offered them previously—but they were still uncommon in 1957.) Other luxuries the Edsel offered were seatbelts and childproof rear locks (which could only be opened with a key). You could shift gears in your Edsel by pressing buttons, which was another neat innovation. It seemed like the future of the gearshift, but it never really caught on, as anyone who’s ever driven a modern car with a standard transmission can tell you. In fact, the car itself didn’t catch on. Despite all the promotion, the TV special, the bombardment of radio, magazine and newspaper ads, the Edsel just didn’t sell. The reason was that it just wasn’t a very good car. Word of mouth did more to influence customers than any advertising ever did, and the word of mouth was that it was a lemon. The warning lights and push-button gearshift were great ideas, but they just didn’t function well. The car didn’t get the support it needed from the Ford executives when it came to designing and building it. The product fell far, far short of its advertising. As a result, the name Edsel became synonymous with great-sounding ideas that won’t, or can’t, work. 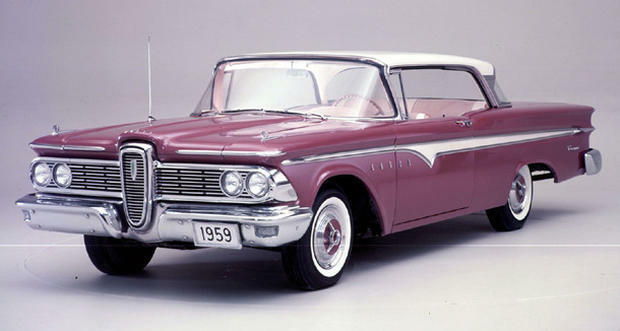 The Edsel continued until 1960. Ford built about 118,000 Edsels, and projected sales of the cars fell far short every year. By the end of the Edsel program, Ford lost about $350 million on it—an incredible sum. The silver lining: the Edsel is one of the safest automobile models from car thieves ever. Only one of them was ever reported stolen! An actual Edsel, loaded down with passengers and baggage like this, probaably wouldn't have such an easy time on that hill.